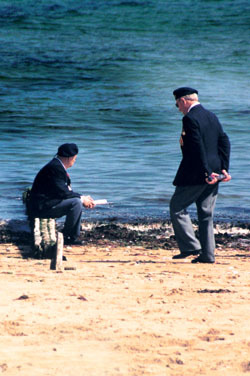 Two returning Canadian veterans are absorbed in a moment of reflection on Juno Beach. “Merci vétérans, merci Canada,” a Frenchman shouted from the crowd lining the narrow road as a cavalcade of Canadian veterans in restored World War II army vehicles passed through a small Normandy village en route to Bernières-sur-Mer for a vin d’honneur. It was Friday, June 4, 2004, and the official Veterans Affairs Canada delegation was on its way to the first of many events marking the 60th anniversary of D-Day. Throughout Normandy, Europe and the Western world, on television and radio, in newspapers and magazines, there was much ado in early June about D-Day. The attention of governments, the media and the public was well deserved for it is clear that the Allied invasion of German-occupied Europe from the sea was a major turning point not only in WW II, but also in the course of the 20th century. D-Day—June 6, 1944—allowed the Allies to gain a foothold from which they were able to mount offensive operations and roll the Germans back. The Allied offensive, combined with the advance of the Soviet Union on the Eastern Front, led to the defeat 11 months later of the Nazi regime that had brutalized much of Europe beginning in the late 1930s. From left: Bruce Melanson of Col. J.E. Straight Branch, Toronto, sports a clutch of flags; Maj. Jack Gallagher of West Vancouver and the Canadian Scottish Regt., Maj. Gerry McGowan of Kingston, Ont., and the Toronto Scottish Regt. and Leading Seaman Ed Penney of Scarborough, Ont., and the Royal Navy were members of the official Canadian delegation; one of the many Legionnaires in attendance. The French people in particular know the scope and significance of D-Day. Nearly 150,000 soldiers of 14 nationalities were disgorged into Normandy by 500 warships and 4,000 landing craft, and by planes and gliders dropping three airborne divisions. “Sixty years ago the soldiers of freedom landed here, rising up from the sea, under a deluge of iron and fire, to liberate France,” President Jacques Chirac declared. Certainly the French president recognized the 60th anniversary as a time for national commemoration by France and each of the Allied nations, but he was also intent on using the occasion as a springboard to reconciliation, to affirmation of a new, peaceful order in Europe. This was the motivation for his controversial decision to invite Chancellor Gerhard Schroeder of Germany. And so, after the participating nations conducted commemorative ceremonies in the invasion area on the morning of June 6, the French government staged an elaborate international ceremony at Arromanches in the afternoon. There was television coverage, much of it live, around the world. The guest list, and the security, were things to behold. Heads of government included United States President George W. Bush, Russian President Vladimir Putin, United Kingdom Prime Minister Tony Blair, German Chancellor Schroeder, Prime Minister Paul Martin of Canada, the presidents of Greece, Poland, Slovakia, the Czech Republic and the prime ministers of Australia, New Zealand, the Netherlands, Belgium, Norway and Luxembourg, while heads of state included Queen Elizabeth II, Governor General Adrienne Clarkson of Canada and royalty from the Netherlands, Belgium, Norway, Luxembourg. A march past by veterans was followed by the presentation of France’s highest award, the Legion of Honour, to one veteran from each of the 14 nations, with the Canadian recipient being Jan de Vries of Pickering, Ont., who served in the 1st Canadian Parachute Battalion. This was followed by a spectacular tribute projected onto giant screens. The centrepiece was President Chirac’s message to the invited guests, and the world. He said, in part: “On that sixth of June of immortal memory, the tide turned. Victory was still far off. There was much suffering to come. And the journey to the end of the night would continue for a long time yet in the death camps. But nothing, no further folly, could stop the march towards freedom, the march towards peace now. “Nothing could stop a new international order from forming, an order founded on respect for mankind and for the law, on freedom, justice and democracy, an order that is still symbolized and guaranteed today by the Charter of the United Nations. “No one could stop the peoples of Europe from coming together, reconciling their differences and reuniting…. As we commemorate those decisive moments in our history, I wanted Germany to remember with us those hours when the ideal of freedom returned to our continent. “For several decades now, the bitter enemies of the past have been building their present and looking to the future together. With respect for history, the soldiers, the suffering and the blood that was shed, we are celebrating together the victory of peace and democracy. We hold up the example of Franco-German reconciliation to show the world that hatred has no future, that a path to peace is always possible. With force, we express our joint commitment to the goal of a Europe reunited around its values and reconciled with itself, its geography and its history. Top-level participation characterized the Canadian commemorations. Queen Elizabeth took part in the keynote ceremony on the morning of June 6 at the Juno Beach Centre at Courseulles-sur-Mer. 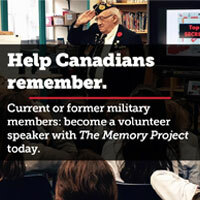 Despite the Liberal party’s flagging electoral fortunes, Prime Minister Paul Martin left the federal campaign trail to participate that day, as did Veterans Affairs Minister John McCallum. Others present included the chief of the defence staff, General Ray Hénault, and WW II veteran Smokey Smith, 90, the last surviving Canadian recipient of the Victoria Cross. In many ways, however, the key Canadian dignitary was the Governor General, whose father fought against the Japanese in Hong Kong in 1941. Accompanied by her husband, John Ralston Saul, whose father came ashore on D-Day as a member of the Royal Winnipeg Rifles, she participated in events for five days and had an important message for all of Canada’s WW II veterans. Speaking at a June 4 dinner with the delegation, the Governor General said: “I look out tonight and I think of you when this enormous event happened 60 years ago. You were so young. It is shocking, always, to remember that most of our volunteer soldiers were teenagers…. “…You fought bravely and you fought well, and you were the only part of the invading armies that was able to reach its objective on June 6th itself. Thinking of your part in this invasion, we can focus on your identity as soldiers of the 3rd Canadian Division, the 2nd Canadian Armoured Brigade, the 1st Canadian Parachute Bn., the 2nd Canadian Corps, the 1st Canadian Army, or among the Canadians serving by air and sea. “And yet, to a great extent, you are unknown to all of us who are fortunate enough not to have faced what you did. Even your spouses, your children, your best civilian friends are unlikely to understand a part of you that was forged on these battlefields in those days…. “For most of you, most of the time, these memories and images have been kept inside. So, in a way, your service to your country has never ended. In the fires of war, you defended the freedoms that we cherish today and you have continued to protect us from those horrors by your silent reserve. For you, war was not an exploit to be bragged about. War and your experience in it has been a burden to be borne, a lesson to be learned and lived. “The words ‘thank you’ seem so feeble. I know there have been times when, in the midst of our country’s rush to rebuild and to enjoy the fruits of peace, you might have felt we were forgetting those whose service had allowed those fruits to ripen. But on an anniversary like this, we can see the heightened interest, the real desire to know what you have done for Canada and for the world. You know, and so does your country, that your sacrifices and those of your fallen comrades did not go for nothing. They have nourished the Canada that we know, with its decency, its dignity and its independence…. We do not forget. D-Day and the Normandy Campaign, as well as representatives of national veterans organizations, with First Vice-President Mary Ann Burdett of Terrace, B.C., representing The Royal Canadian Legion just days before her election as the organization’s first female president. The delegation put on some events and plugged into others, including three sponsored by the Canadian Battlefields Foundation. But there were also quiet times when the veterans reflected, or shared their experiences from 60 years ago. Sergeant Stan Muir of Thunder Bay, Ont., landed on D-Day in B Company of the North Shore Regiment from New Brunswick. “We had a good troop. We were trained for battle, well-trained for four years. We knew what to expect. It was just natural,” he said. “We had to build a beachhead and so we had to push on. An officer fell in front of me. I carried him up to the (sea)wall. I sat him down, took his .45 away from him and put it in my belt and I kept right on going. And the officer that I saved off the beach, he died last year in New Brunswick. Colonel T.G. (Garry) Gould of Dorval, Que., a member of Sir Arthur Currie Branch in Montreal, represented the Sherbrooke Fusiliers, a tank regiment he joined as a reinforcement a few weeks after D-Day. His greatest pride comes from the fact that in August the tank troop he commanded was out in front of the entire Canadian Army during one phase of the massive push that was Operation Totalize. “After two months of battle, with infantry repeatedly trying to acquire domineering positions on hills and whatever, it was decided that a better method could be devised…” and the infantry went into action riding in Kangaroo armoured vehicles behind the tanks on the night of Aug. 7, 1944. The idea was to close a gap south of Falaise and complete the encirclement of the enemy who were trying to escape the right hook being developed by the American military. “The objective had been defined for us very cleverly by the use of aerial photos. Eight-by-ten glossies were presented to us before the attack so that we could study them and pick out defined items that we could report back on. This proved to be very handy…. He’s modest about it, but Gould was wounded in the right arm and forehead that night and taken to hospital but soon returned to his regiment. From these private stories, we shift back to the many public manifestations of Canada. The Normandy coast was teeming with veterans returning on their own, or as part of commercial tours combining commemoration with sightseeing in Europe. The Canadian Forces sent a contingent featuring the Naden Band of Maritime Forces Pacific in Victoria, the Skyhawks Canadian Forces Parachute Team and, under Captain Allan Champion of the Queen’s Own Rifles and Highland Creek Branch in Toronto, a ceremonial guard composed of reservists from units that came ashore in ‘44. Other participants in some of the commemorative events included the Burlington, Ont., Teen Tour Band, Calgary Police Service Pipe Band, Edmonton Police Service Pipes and Drums, and performing artists La Troupe V’la l’Bon Vent of Quebec City. From Europe came the 48th Highlanders of Holland pipe band performing in replica 1943 uniforms of the 48th Highlanders of Toronto, as well as the Keep Them Rolling and Je Me Souviens associations which provided vintage military vehicles. The youth reps were asked to become youth ambassadors on their return home. So instead of bearing arms as the WW II generation did, they will help make their contribution to Canada by passing the torch of remembrance to their peers in keeping with VAC’s commitment to carry on the tradition of remembrance after our veterans are gone.